St Jean de Luz is a famous French seaside resort since the end of the 19th century, which first extended over the marshlands and later also to the north. The shopping streets only for pedestrians, with the harmonious facades lead you to the port and the Louis 14th square. The Thalasso therapy center, casino and Chantago golf course give St Jean de Luz its unique appearance. At 400m is the Erromardie beach, one of the 5 beaches of St Jean de Luz, in the heart of a private park framed by pine trees. Domein Iratzia is completely absorbed in her environment. The facades of some buildings overlook the sea in the shade of the old pine trees, while the others look out onto the mountains. It is about 2.5 km from the city center and 1 km from the nearest shops such as bank, chemist, supermarket, grill stand and bakery. This hotel room is suitable for maximum 2 persons and disposes of a double bed. It includes a bathroom or shower room, WC, hair dryer, telephone, free TV and WiFi (certain rooms feature a balcony). A minibar is at the guests disposal as well as a restaurant with a total area of 85 m² along with a non-covered terrace of 70 m² and a multi-activity room of 105 m². As a guest you can use a free heated outdoor swimming pool open from mid-April to the end of September, restaurant with terrace, tennis for a fee, rackets and balls can be rented, pelote basque playing field, WiFi internet for a fee in all accommodations, laundry for a fee, parking space in the basement, 1 space per apartment free of charge. Thalassotherapy at Saint Jean de Luz. Overview of special prices for Odalys guests; access to the spa and fitness center, thalasso therapy: 1 day discovery, 3 days relaxing, 5 days a good feeling. Information and reservation is possible at the Residentie. The hotel has 29 rooms with bath or shower, free television, paying WiFi, safe and a balcony or terrace. During the summer, fun activities are organized for children: July and August free, children's activity club for 4-11 years old for five half days per week. Bed linen is included in the price. Deposit and tourist tax (amount per person per day) must be paid locally. Pets are not allowed in the hotel. 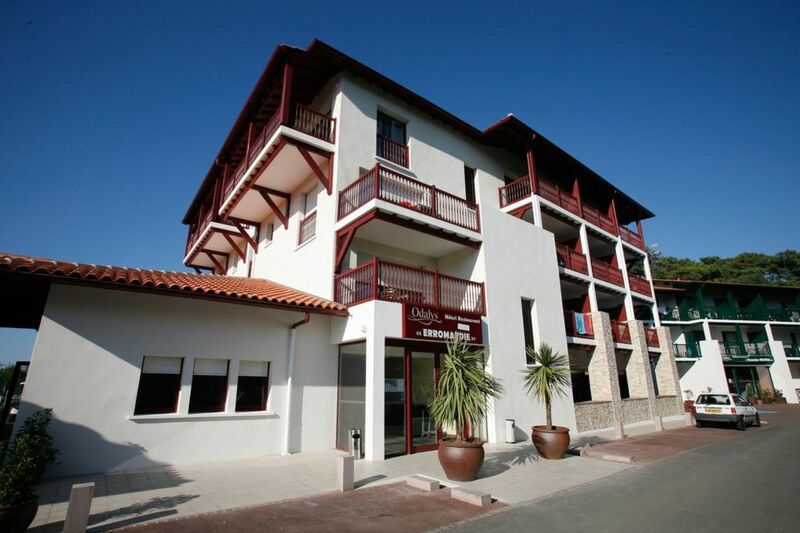 The resort has a surfing school, canoe trips, mountain bike, scooter and motorbike rental, Thalasso therapy centers, climbing courses, casino, mini golf and a restaurant with 85m2 surface and a terrace of 70m2 and a multifunctional space of 105m2. Relaxing activities; ellke sunday at 11.00, Place Louis XIV, music shows, folk dances, guided tours of the city organized by a tourist agency during the school holidays, spring concerts at the Maurice Ravel academy in April, boat trips between April and the end of September, small tourist train of April until October, Andalou festival at St Jean de Luz bay in May, St Jean festivities in June. There are relaxed activities in July and August such as "Tuna" Festival; International Basque handball championships at Cesta-Punta; Basque chess game at Chistera with your bare hands; local folklore shows and "Force Basque" every week in the community St Jean de Luz at the Basque pelota stadium, dances and "Toro de Fuego" concerts every Wednesday and Sunday at Place Louis XIV; concerts are held with traditional Basque songs; St Jean Baptiste church and "Toro Piscine" at the Erromardie amphitheater. In September: Music Festival on the Basque coast and the long distance triathlon. In October; Young Film Producers' Festival. WHAT you really must have seen; Toro Pisine Labat- Eurromardie amphitheater at Saint-Jean-de-Luz, The bull show should not be missed. Every Sunday and Wednesday in the bull show is not to be missed !!! Every Sunday and Wednesday in July and August there is a show with real animals.